Positronium is an exotic atom made up of an electron and a positron in orbit around each other. Positrons are the antimatter equivalent of electrons, so these particles are highly unstable composite particles made up of both matter and antimatter. Because of this, positronium atoms only last a few nanoseconds before the matter and antimatter annihilate each other. Despite their short lives, these peculiar particles have interesting features – including being able to form compounds despite not actually being an element. UCL is home to the only positronium beam in the world. In this device, positrons created by a radioactive source pass through a chamber of hydrogen gas, where they pick up electrons, before being guided towards a target. 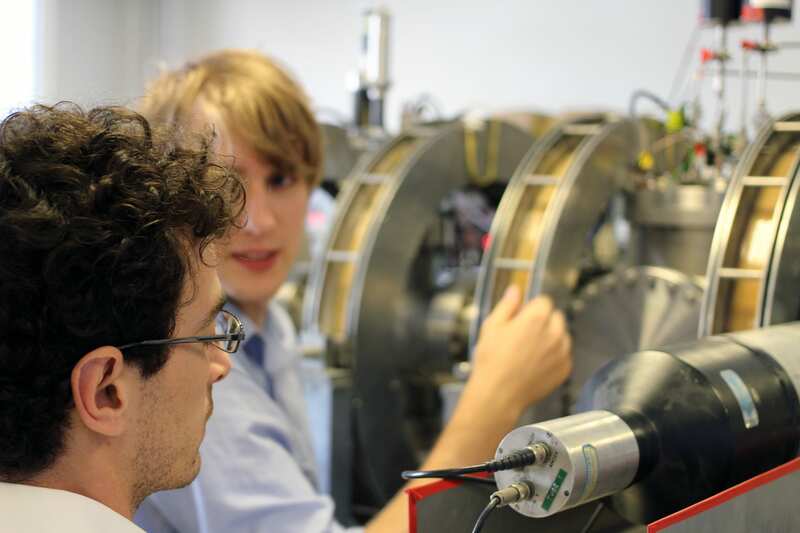 Standing by the Positronium Beam in this photo are UCL PhD students Andrea Loretti (left) and Sam Fayer (right), both from the Department of Physics & Astronomy. The Science at UCL blog publishes news, anecdotes and photos highlighting the work of UCL's scientists and engineers. All text and photos on the Science at UCL blog are available under a Creative Commons Attribution 4.0 International License unless otherwise specified. This means you can reuse our content freely providing you credit the source. Note that this does not cover third-party material embedded from other sites (e.g. YouTube).